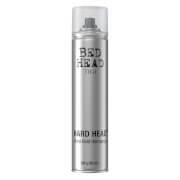 Create instant volume with TIGI Catwalk Your Highness Firm Hold Hairspray as the form-fitting finish keeps your style in place. Botaniacals of violet, jasmine, lavender and wisteria, along with a UV barrier help protect hair “on location” and throughout the seasons. 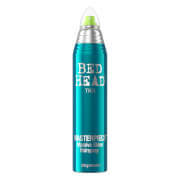 For a form fitting style TIGI Catwalk Your Highness Firm Hold Hairspray gives an invisible, strong hold and a frizz-free finish. With a blend of lavender, wisteria, jasmine and violet the spray will condition hair and fight static, while also ensuring your style stays put all day and night. Not only will you be left with unbeatable hold, the citrus fragrance will make your hair smell amazing too! Long lasting, strong hold finish. Helps to protect style on location. 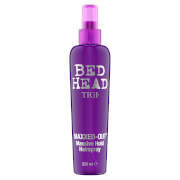 Spray 10-12 inches from hair, then lift and spray inside the style. Cover with a light mist to finish. Alcohol Denat. (SD-Alcohol 40-B), Hydrofluorocarbon 152a, Aminomethyl Propanol, Parfum (Fragrance), Triethyl Citrate, Octylacrylamide/Acrylates/Butylaminoethyl Methacrylate Copolymer, PEG/PPG-17/18 Dimethicone, Pentaerythrityl Tetracaprylate/Tetracaprate, Ethylhexyl Methoxycinnamate, Jasminum Officinale (Jasmine) Flower/Leaf Extract, Wisteria Sinensis Extract, Benzyl Salicylate, Glycine Soja (Soybean) Protein, Alpha-Isomethyl IononeHexyl Cinnamal, Butylphenyl Methylpropional, Viola Odorata Flower/Leaf Extract.